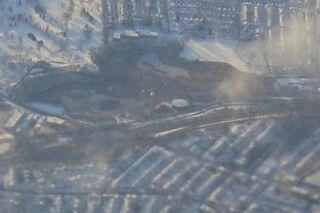 This photo shows an aerial shot of the WTWS from a Boeing 737 taking off from Newark Liberty airport at about 8:00 in the morning of 2012/12/30. The altitude is 2000 feet or so, looking south. A 2 to 3 inch covering of snow from the previous day lays on the ground. The sphere is visible in the center of the photo. Ponds of the Kawameeh swamp border the left and top of the tower. Route 22 and the Garden State Parkway border the bottom. Light could cover obscure many of the houses, but the WTWS shines through clearly. Enjoy this rare aerial sighting and the rest of 2013. This entry was posted on Tuesday, January 1st, 2013 at 4:53 pm	and is filed under Experiences, Photos. You can follow any responses to this entry through the RSS 2.0 feed. Both comments and pings are currently closed.